I collect vintage cardboard ephemera such as postcards, board games, matchbooks, CB radio QSL cards, and other memorabilia from forgotten places and times. I have about 80,000 items in my collection. I love old motels and restaurants and roadside attractions. The more mundane the better! When my wife started grad school in 2008 to earn her PhD, I knew I needed a hobby to pass the time while she was studying. I’ve always been a bit of a collector and antique-store shopper; I had a nice collection of postcards. I bought a cheap scanner and started to post my collection on Flickr. I noticed a lot of collectors weren’t adding any details to the photos of their items. Being a bit of a history buff, I started telling the stories behind the items I shared online. My collection and hobby grew from there. I have a room in the house that is dedicated to my collection. I store items in archival boxes and closely watch the temperature and humidity levels in that room. As for displaying items from the collection, if it’s topical, of personal interest, or unusual, I will display items around the house. I do have a board game called Gary, Indiana. I love it because it’s really boring. What do you consider to be the Holy Grail of cardboard ephemera? I own a CB radio QSL card from Betty Ford. It’s important from a presidential and radio history perspective. It’s a significant piece. The oldest item I have is a card that businesses sent in the mail to collect outstanding debts from their customers. These cards pre-date postcards. As for a Holy Grail that I don’t own, there might be one that I’m unaware of that will change my life. I’ll spend hours in vintage shops and antique stores scouring shelves and bins. You never know when something will pop up, but there’s nothing particular I’m looking for at the moment. That’s the trouble with collecting such a wide variety of objects, it’s cumbersome to keep track of everything that’s out there and to scour stores looking for something in particular. What advice would you give to someone interested in starting a similar collection? Pick something and stick with it. Keep an open mind and look for something that brings you joy. What resources do you use to acquire knowledge about cardboard ephemera and connect with other collectors? A do a lot of research through newspaper archives and newspapers.com. I’m more of a lurker on Facebook and online than a contributor, so much of my research is done on my own. 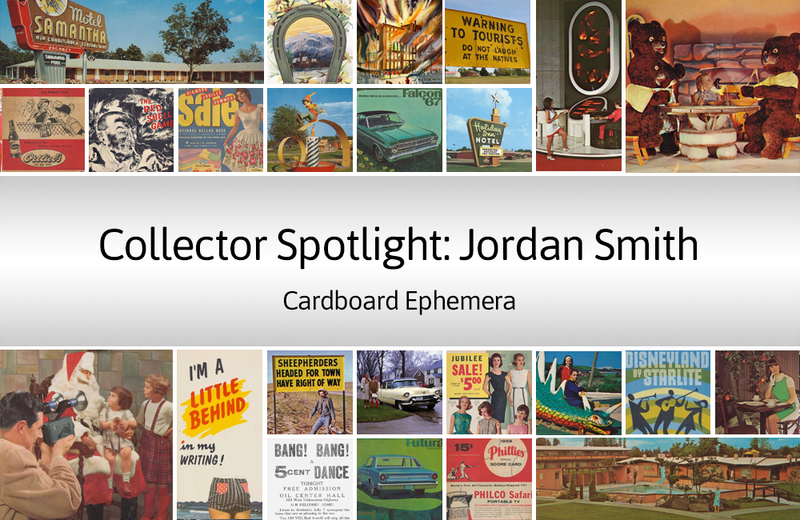 Learn more about Jordan’s collection on cardboardamerica.org.